Her life is so amazing. My life is so bland. She has the best clothes. My clothes are awful. She has a perfect body. I am so fat compared to her. How does she look so perfect working out? I do not look like that when I work out. She is always on amazing vacations. My life is so boring. She has such a successful career. I am such a failure. She always looks so happy in her photos. Why am I not always happy. If I was successful like her, then I’d be happy. If I looked like her, then I’d be happy. If I could go on vacations like she does, then I’d be happy. If I had her clothes / bag / car, then I’d be happy. If my life looked like hers, then I’d be happy. Does any of the above sound familiar? Its probably similar to a conversation you have had with your mind while you are scrolling through instagram, I know I have on many occasions. The initial subconscious comparison to someone we don’t even know personally, turns very quickly from ‘oh that’s a nice bag’ to ‘if I had that life, I’d be happy’. It’s a slippery slope, and one we have to be very aware of and take initiative to identify in ourselves & implement some changes around. I thought about this for a while, and tried to approach it in a way to look at our 'compare & despair' approach. I recently wrote a piece for PopSugar that touched on the power and importance of words, now more than ever do we have to be aware of not only the words we use, but the perception of reality we attach to such titles and the impact of that. I wanted to explore that a little further in this instance. I don’t need to explain the platform of social media and how it works, as you are no doubt already familiar with it, as I am sure you are the term ‘Influencer’. For a very quick overview, by industry appointment an ‘Influencer’ or ‘Digital Influencer’ is someone a brand would engage to promote their product, service or experience. This is either for contra (exchange of the product / service / experience for promotion / coverage), or for payment for promotion or coverage. “Influencer” is a term that has never sat well with me & I think the danger in what we connect to the title is impacting on our subconscious, which very quickly becomes our version of reality. Just to be clear; I don’t have problem with the role, I understand the need for the role in the digital landscape we live in. My issue is with the attachment of power we give to someone whom society / social media has bestowed a title. 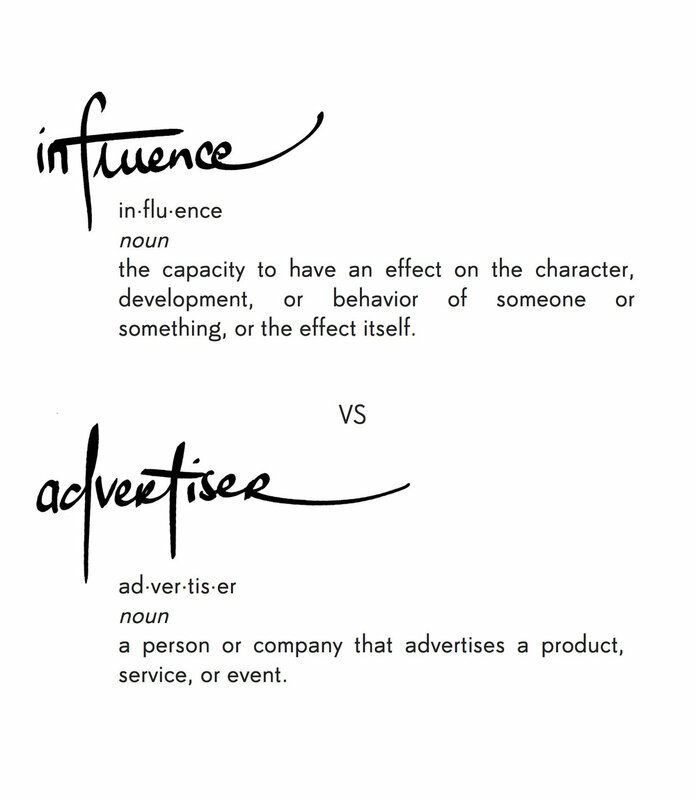 To me the word "influence" is powerful, it is something that sways me to do something, to believe something. It is dominant. It is forceful. It has effect. noun; the capacity to have an effect on the character, development, or behavior of someone or something, or the effect itself. To me, influence also has an organic element to it. The anti-sell if you will. A sharing of knowledge or information. I am not sure who coined the term ‘Influencer’, I suspect when social media came out before paid partnerships, it was applied because it was exactly what the term suggested. It was people posting things they liked because they really liked them and they wanted to share it with their community. As with the digital age we find ourselves in, things moved quickly. The organic influence that started as social and photo sharing platforms swiftly developed into big business. No problem here, I love business. I am very invested in the nuances of branding & business building and I admire and respect people who build themselves as brands. Kudos to the FTC (Federal Trade Commission) who implemented some pretty strict laws to ensure transparency was shown on Instagram posts of what was an organic share and what was an organized / paid product placement (you can read in depth what the rules are HERE). 1. People started to communicate by sharing things they personally liked, which organically put what they liked in front of their community. It could be that people in their community were influenced to buy the product because they had seen that someone they followed had posted that they liked it. So, essentially the person who was posting organically about things they liked became an “Influencer”. 2. From there, some people of influence found a voice or visual style, and started to build a “Personal Brand” on social media that resonated with their growing community. To me, that is where the term / title of “Influencer” should have ceased. 3. Businesses started to take note of these “Influencers” and started to gift them their product / service / experience with no formal agreement, in the hope they might post about it. 4. When the businesses started to see interest growing in their products being posted about, they would approach “Influencers” and come to a mutual agreement to pay them or gift them free things, in exchange for an agreed amount of coverage of their product. The laws changed around Influencers, meaning that they now had to disclose when they were being paid to advertise something, but their industry title didn’t, so consumers still look at them as Influencers, when in reality, they are “Advertisers”. They are paid, to advertise. noun; a person or company that advertises a product, service, or event. As I said, I have absolutely no issue with the role and think it is very relevant to the landscape and how we consume information and products. I have a brand that pays people to advertise our product, I also get paid as a spokesperson or ambassador to advertise brands / campaigns. Here’s why; The term “Influencer” suggests that having influence is for an elite group. Usually determined by the number of followers you have. Lets step out of social media for a second. Go back to school, if we were to parallel a modern day influencer to the school playground, who would get the 'Influencer' titles in your primary school? Usually the most popular kids with the largest following. We’ve been conditioned that only people with a large following have influence. Social Media has caused us now to not only given that an incorrect title, but also financially reward it at a tangible target being 10,000 followers, then see your fee step up into the higher payday territory. Now, ask yourself this; When you look at an ad in a glossy fashion magazine, do you look at it with a mindset knowing that it is clearly an advertisement? I know my answer is yes. I know that it has been produced to sell product. The image had a team of people work on it, and it has been through retouching and post production. Now think of who you follow on Instagram, think of the “Influencers” you follow. Do you look at their pictures as you do paid advertisements in magazines? My thought is that our affiliation to the title, as well as the platform it is sitting on (social media) that “Influencer's” images (which let's call them what they are; advertisements) appear in and amongst our best friend's baby pics, your sister’s dog spam & your mother-in-law's cruise ship holiday photos - do we by default put these into ‘normal candid life snaps’? Do we have such a strong connotation to the term “Influencer” that we are conditioned to see their photos as real life, and therefore compare our actual real life to it? I do not discredit the people who have made this their career. An Influencers job is to present a glossy life, that is their job, & the better they are at it, the further their careers go and the bigger gigs they get. It is a job. My suggestion is to start to look at the “influencers”, as advertisers. Look at their content as very planned, very styled (no matter how candid it looks), very edited through selection & post production. Its purpose is to sell product. If we can make this differentiation in our approach, at the very least it may allow us to alleviate some of the harsh comparisons we make of our everyday life vs what is produced and edited to look like an everyday life.